In Fuente Carreteros, one of those white villages in the Cordovan countryside, José Manuel Dugo Varo lives and has his workshop. When we take a peek into Jose Manuel’s life, we can see a true example of someone with a calling and a real passion for Geometry. 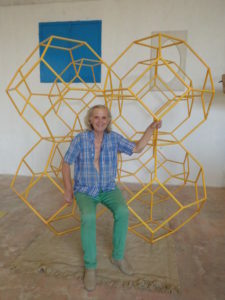 Since he started creating polyhedra in 1981 his working with geometry has been a continuous source of inspiration, creativity and artistic expression. Jose Manuel has re-discovered different techniques for the construction of polyhedral shapes and has developed the creation of polyhedra from the size of a nut up to 20 foot in diameter. At the same time throughout this creative journey José Manuel has set in motion a process of becoming more sensitive to the subtle aspects of polyhedra, while developing different ways to apply the resonant fields of geometrical shapes for the harmonization of spaces (geo-puncture) for healing and personal growth.